The girl group - consisting of Karis Anderson, Alexandra Buggs and Courtney Rumbold - are set to return with their second album this year and are already planning on touring with a mystery "massive" artist. 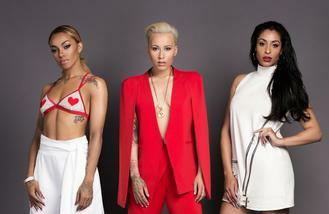 Karis exclusively told BANG Showbiz: "There is a massive name that we can't name. Fingers crossed it happens. If it does it will be major like, major. A certain male." Meanwhile, the girls have been to songwriting camp getting songs together for their forthcoming record. Asked if the album is finished, Karis said: "Nearly. It was half way finished and we've just had a writing camp and got a whole influx of new songs that we've written. So now we are like we need to do more recording and get it all done. We are going to have a lot of choices to choose from, which with our last album we didn't have." The follow-up to their debut 'London with the Lights On' is expected to drop this summer.